Fabrizio is one of the few men I know that can pull-off a club collar shirt. On him it looks so normal. very elegant, very italian chic, love this one. Yes he can indeed. I really like the colour combo he is sporting. I wish I have his hair (smile). We can recognize the same fashion sunglasses than seen before, the Hermes touch as well with this incredible gold leather's color. I do love the execellent mix with patterns (jacket, shirt and tie). He's very fancy. But… how HOT must he be? I mean… I'm in Ireland and everyone's wearing t shirts. How hot is it in Milan to be wearing a shirt and tie and cardigan AND jacket? ! love his sunglasses and his style is just incredible! perfect! love the outfit!! !so gentlemen like! So chic, adore the glasses and the tie! I love his shades…Does anyone know what glasses those are? the shades are fresh but the belt pulls it all together. How do you feel when you use a club tie-tuck? Is it itch? or does he have a undershirt? My first thought was mmm mmm…he is nice, and beautifully dressed–my 2nd thought was… not sure about the camel cardy. There is enough going on without it. I'd leave the belt though. It reflects the slight hint of ginger in his hair and beard. the shades are fresh. but the belt pulls it all together. I wonder what's the temperature outside – it doesn't seem to be cold out there… and the singor is so packed – a shirt, a cardigan and a jacket!…hmmm. for me, this nice genteleman is trying too hard… though the fabrics and the tailoring are undeniably de-luxe. Great look, love the belt! this is nice, love the "tie-tuck" . And the jacket is more than awesome! My brother pulls off the club. extraordinary for this hot days :) it's too hot here in İstanbul! I can admire this from afar. He looks like someone out of Proust. The only thing I dislike is the cardigan opened to show off the belt buckle. There's a certain flair to the military tie-tuck. It's very appealing. The more you look at the picture, the more you realize there's so much going on with the checks on the jacket, the striped shirt and the polka dotted tie. And then in the midst of all that fabric, the metal buckle. It really shouldn't work but it just does. now he really can pull of a club collar shirt… right, off the selfridges to hunt one down for the boyfie! Love it. Personally I always feel that a jacket should be done up if you're stood up, undone if you're sat down. Doing up the one button here would make this look even more perfect than it already is. Great style! your so right, we don't se is enough! This guy looks like he has the confidence to pull of anything. He is very well put together. Love the little peak of Hermes there. I love everything but the hair, almost has a look out of the distant past like a dandy might have worn. But, all in all, he is sharp as a tack! love everything about him! unfortunately i don't see often men with such a good sense of style. Brazilian and international Fabrizio Rollo! His jacket is great – very cool look. I use to tuck my tie like this with my school uniform, blazer and kilt, it was about the only time a girl could wear a tie. lekisskiss.blogspot.com <– texas gal bloggin fashion from NYC! Why would you tuck in your tie unless you were eating soup? The layering on the top half is impeccable. He is dressed nicely, but the tie color is too light for the jacket, the military tuck is useless when wearing a cardigan – the tie should be placed inside it. The belt with the designer logo is out of place in the setting and his pants need pressing. It might be a vest vs. a cardigan, but still, he must be sweating bullets unless the weather is cool. It is a great layered look though. I like everything but the belt buckle. A big gold "H" is just so gaudy! It's like the Louis Vuitton bags. Love everything about this. Great manly beard. Voice of dissent? The tiny collar and tiny (looking) tie throws the proportions off. Those would be a great way for a woman to playfully wear a shirt and tie (without the blazer) but on a man of his stature, it's not becoming. A man terribly concerned, his pose is not male nor elegant. I think his neck/shoulder structure is what makes the difference, he looks good because it's well proportioned. The color choice is immaculate, the caramel and gold of the belt make it stand out even more, but what makes it look so great is his hair color, it matches the color palette perfectly. I would've loved to see the shoes! wish we could dress like this on the west coast. I love the military tie tuck too. You're right, we don't see much of that anymore – a fashion fad that, sadly, is passé to a large extent. I'm a little ignorant. Does Hermes even make belts without the "H" for people who don't need to flash? you are so right… didn't even notice the collar! A man you would turn around twice for – gorgeous textures and colors mixed together by an expert. My guess is that the club collar shirt works on him, because he has a long neck. For my taste, there are too many details visible. i love everything about this look . the tie-tuck is my favourite part . the dotted tie and plaid blazer and stunning , and the tan cardigan is perfect with the look . Perfection! Great color combo. Italians are the masters of style. The hermes belt is just terrible, sorry. Paul McCartney wore a club collar on Letterman the other day. The tie tuck reminds me of a piece of advice contained in a NY Times mag piece by a former police detective: "Always wear a tie clip to an autopsy." I'm enjoying this look, but am not keen on the logo belt buckle. Pretty cool look. Actually dislike club collars but it works real well with a cardigan. Dig the blazer the most and the shades second. Two things I'm not into is that I feel like just one color should be taken away from this ensemble. Also, I've grown to dislike the Hermes belt because so many of the wrong people in LA wear it. The textures + fabrics are of sheer beauty, yet the Hermes Belt is….. Yikes. My eyes immediately went to that belt buckle. I like the fit of everything he is wearing. He has layers but still has a slim silhouette. He looks very neat and put together. Thoughtfully dressed. I agree!! Love his sunglasses! I love this colour combination for summer, the dark check on the jacket with the fresh muted blue and white striped shirt. The tie is slightly off white and so pulls in the colour of the camel sweater. The pants almost look silk? He looks great, pulled together and very uncasual which is such a switch for summer. I love his look! Really great! 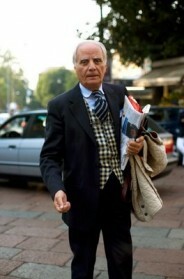 One of the most fashionable men I've ever seen, but then again he is Italian. It is true, that so few people can pull off the club collar look, and so effortlessly. I love how his beard and long hair juxtapose this very put together look. For me, it's all about the Polka-dot tie. too studied, in my opionion. And I don't like the showing off of his Hermes belt either. Honestly, how long does a guy like this take to get ready in the morning? I love that club collar, but the camel sweater is a bit much…but then again Italians have such sprezzatura, they can make almost anything look good. I remember this guy—dig that hair action! Scott glad you drew my attention to the Military tie tuck – that has solved a particular style conundrum I was faced with. Such stylistic nuance's are reason enough to read this blog or watch old movies! thanks scott. Positively cool looking. I wish I could pull off club collar shirts. The jacket pattern is incredible as well! Dapper! One of my favorite Men's shots. Nothing new for men, as always. Where are all the skirts and heels seen on different fashion shows? Where are the colours, where is the transparency, the patterns, … ? Love the color match. The whole concept is so chic… I just love it. Santiago de Chile in a different way! What you wear is all about what you are, right? ( or at least most of the time…) You might dress the way you feel comfortable and at ease with the choice of the colors, etc, and you don't really worry about what the other people say. On the other hand you choose everything and ways to dress thinking about what others would think of you. (I'm only mean in a positive way, don't get me wrong)So this gentleman to me fits in the latter type, at least this day. He calculated every single detail and surely he CAN do it. Fabrizio is a beautiful man. And he can kind of pull off everything. Oh the vest how I love it!!!!! Its golden color combined with the overall look of the outfit makes it all work just so! Wow I love how his tie is tucked into his shirt. I also love the shades and hermes belt. Great photo. I don't feel very much about this gentleman looks 'normal,' really. Mostly I see a lot of self-consciousness. Lots. Isn't it summer in Milan? Damn! I agree, the military tie-tuck and the club collar look great on him. Unfortunately, the cardigan appears to be unbuttoned specifically to reveal the logo on the belt which, for me, ruins the look. It's if he's trying to prove something. Logos on clothes have always seemed tacky to me. Oh no this is too snobbish! Come on, not the Hermès belt…but the glasses yes. He needs to button up and relax. Love the combination of everything except the tie in the shirt while wearing a cardigan that should be buttoned to the near end. Its like he is trying to show off the belt. Beautiful as it is, it looks a little gauche. Great tailoring relected here. lovely details. the belt, slim silhouette, sunglasses, tie tuck, vest and collar all come together beautifully in this mixed neutral ensemble. …..I'm sure it took a bit of time to work this look together. Overall, good but more of a "mannequin-look" than a nice natural style. Kudos to Fabrizio. Stylish, elegant, great tie idea-can't wait for cooler weather to emulate this. mmmm really interesting…he's very confidence …and I adore that kind of men! Love it! And the belt. hey he looks great… damn all the nit-picky comments! (I reckon the pants look pressed! )… the modern embodiment of a Proustian flaneur! i'm in love! if i could find a man with his style in the world, that man would be my shmoop. so many details.. is it overdone? no, i love it all. matching, but way too mutch! the belt is gorgeous – would pull many a outfit together! we were @ a bar in sydney on the weekend & the waitress had that same belt on with simply black well cut pants & black collar shirt – she looked effortlessly great! 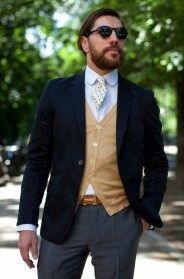 Like the collar and tie style but not really sure about the waistcoat? love his style, wooooooow! Great pic! I just love this look… I don't even know how to begin describing it. I just simply love it! I love the tie and how he wears it…but i'm not shure if i could wear it like him.Practical for a windy day. He is elegant, cultured and intelligent. handsome man, handsome look. he pulls off the military tie-tuck beautifully. I love his look apart from having reservations about that buckle [it's a branding thing], but am more excited to be able to say where his glasses are from. They're Cutler and Gross, I bought a pair from Dover St Market, and I think they're a reissue of a vintage early 80's design. Fabrizio's look is very dapper and the way he styled this look is perfection. Love it. he looks amazing! Everything is fitting together perfectly! The tie tuck. Always advisable before attacking the soup. love the shirt with the round straw! His whole look is so classy! He looks stunning. Love the hermes belt and the tie tuck. Nice pic. Love the added touch of the waitcoat… More men should wear it. This guy looks great I love the colors he's rocking! You are soo right Scott. I didn't even notice the club collar until I read your caption. I also know that whenever I watch old movies with my mom and I see a guy with his tie tucked in (military tie-tuck)I always find it so hot!! To me, it just looks so masculine and un-thought of, if that makes any sense. Love his look but hate his belt! Well, to me a bit too perfect, I think it is the belt that makes it this way for me. For the rest a great choice of texture, of colours, very classic. There is something intellectual about this ensemble and his face. I am hyperventilating. He is gorgeous! His hands are a work of art. The dressed bearded David. I'm not personally super-fond of that particular vest, but overall I really like the look. Maybe I've been fooled because he pulled it off so well, but the club collar looks to me like it would be a perfectly accessible look. I know it's old fashioned, but it's not like he's somehow pulled off a top hat and spats. If I saw one of these shirts at the store, I'd certainly give it a shot. He's very elegantly dressed; but, in my opinion, it's all a bit too precious and contrived, particularly the Hermes belt. There is something regal about his appearance and yet ruggedly polished for a man. He carries himself very well and his look is well balanced and achieved. bravo! The tuck is nice but that belt is off the chain. Love it. The font of the H is wonderfully understated. does not anybody find the vintage hint a bit too overt? i do, although the result is elegant. If he directed a short film, it would surely win awards. Contrast this photo with the guy with his underwear hanging out. This looks nice. And hey, love the camel color of the vest. now here is someone i can actually respect in the vast world of fashion, not some Kanye or brooklin hipster. The jacket doesn't enhance the look for me though everything underneath is just wonderful! I've always loved grey, light tan/camel/beige, light blue on men. a gentleman look…from head to toe & the pose,too. 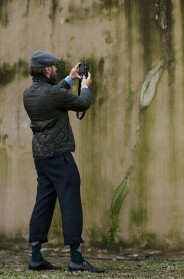 have been following your captures on the chic looks of italian men…they are always surprisingly beautiful! I love the jacket. It seems like he's trying too hard with the rest. Chic, bearded men…*sigh* Love everything about this look, right down to the visible belt buckle. In my opinion: too much stuff. What shades are those? J'adore! Oliver Peoples maybe? very elegant. Anyone know what glasses is he wearing? To be honest, i think this guy is brazilian… her name is Fabrizio Rollo. He is a famous interior designer. so euro. i love the hermes belt. Where's the jacket from? I want one! This man could be me, apart from the beard. Love the outfit, think it would suit a man who is either clean shaven or has designer stubble. This look is brilliant! So stylish! Somehow, it just looks awesome!